The ‘design’ brief to redesign the human impact on Earth from predominantly exploitative and destructive to by and large regenerative and health-generating invites us to ask fundamental questions that define the story we tell about the world and our role in it. Innovating and designing a regenerative culture requires us to live the questions and reflect on our participatory relationship with life and nature. We need to re-examine the founding mythology (and scientific record) of our origin, the cosmological framework that defines our context and offers answers to: Where do we come from? ; Who are we? ; Where are we going? So, where do we come from? There are many ways to answer this question. Cosmology is how a culture answers this story. Over the last 250 years our scientific cosmology has become the dominant story of origin, and what an awe-inspiring story science tells! Yet, as any story tries to establish itself, there is a tendency to discredit alternative ways of seeing and complementary narratives. This seems to be due to the way we tend to frame things in either/or-type exclusive dualisms. The big challenges in changing something as important as our cultural and civilizational narrative is to avoid turning culturally creative narrative into a new dogma and to value the positive aspects of what the previous narrative helped to create. Dogmatic and ideological tendencies have deprived the scientific cosmology of the guiding role that meaning plays in cultural narrative. Science has revealed so much to us, and in part it has done so thanks to the way that the narrative of separation (objectifying the world) enabled many useful scientific and technological innovations. Scientific insights from all disciplines tell an awe-inspiring and meaningful story about our intimate connection with the processes of life and consciousness. Rather than dismissing science we simply need to question where dogmatic tendencies might have made us blind to deeper meaning and significance. Our current scientific cosmology has been distorted by an overly zealous rationalism and materialism, a bias towards quantitative and reductionistic analysis, towards mechanistic instead of organismic metaphors. The economic and biological stories of scarcity and competition offer a mutually reinforcing excuse for inequity, war, and competitive behaviour. We may not yet be ready to offer a definitive answer to the deeper question whether consciousness or matter is primary. We might have to live this question a little longer and explore the wealth of wisdom that the world’s spiritual traditions offer as complementary perspectives to the developing scientific story. It might also not be the appropriate question to ask. Maybe consciousness pervades matter and at a certain levels of complexity this leads to autopoietic distinctions between self and world (life emerging) and at yet higher levels of complexity living beings become self-refelctive and capable of bringing forth more and more complex world through cultural evolution (through the story they tell about themselves)? Fact is that we can, retell the remarkable story of our cosmological origin, using science to deepen our understanding of interbeing and the role of symbiosis and collaboration, rather than reinforcing the cultural dominance of the story of separation and competition. My friend Brian Swimme and his mentor Thomas Berry were among the first to explore how we could find a higher synthesis of scientific and spiritual cosmologies. The magnificence that science has reveal about the nature and history of the universe and life on earth can offer us a cosmology capable of re-enchanting the Earth and our participatory role in the Universe story. Universe — I do not use a preposition on purpose since there is nothing outside, and therefore Universe is not an ‘it’ (object) but a process that spans the inner and outer dimensions (quadrants) of consciousness. The word refers to the all-connecting and transforming process of which all of our lives are creative expressions. Universe is neither object nor purely material, simply put, uni-verse is the ‘one verse’ of relationship, perspective, and participation. 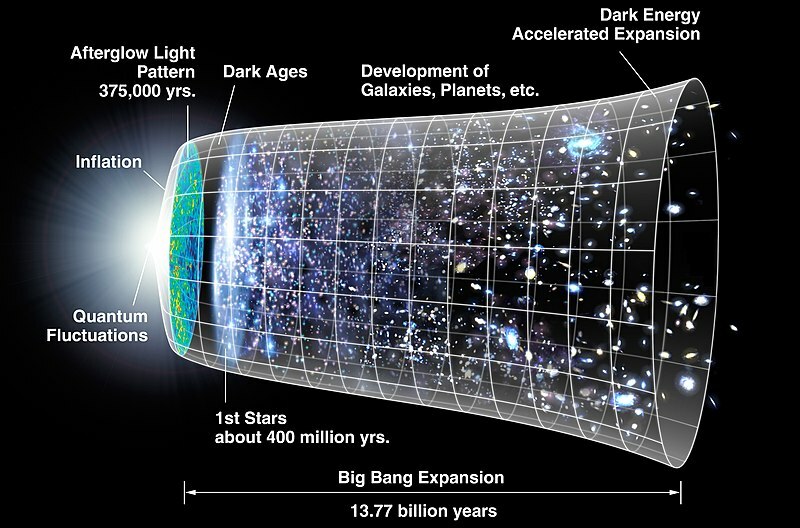 Universe came into being some 14 thousand million years ago in an event we now refer to as the big bang. Whether this beginning was simply an initiation of a new cycle of universal expansion and contraction is a question we have not yet answered. Cosmic microwave background as echos of the time immediately after the ‘big bang’, little ripples that may have given the subtle gravitational impulses for galaxies to form and clouds of gas to form and densify until they ignited into stars. Fact is, the atoms and molecules that make up our tissue, our bones, our hearts and our brains were forged over many thousands of millions of years, as giant gas clouds coalesced by gravity to ignite into stars, lighting up the planets around them, only to collapse a mere 500 million years later in giant supernova explosions, releasing the forces that are believed to have shaped many of the elements we find on Earth today. If you are wearing a golden wedding ring or other golden jewellery, pause, I invite you to marvel at the enormity of space and time as you contemplate that the atoms of all gold on Earth were forged in the immense pressures and temperatures generated by aging stars exploding in giant supernovas, long before the Earth was formed. Earth, the beautiful blue planet we call our home, has been the setting for all the poetry, art, dance, music, and science we have invented to make sense of the mystery of our existence. Our relatively young home planet began to take shape some 4700 million years ago. A few hundred million years later, Life started to transform the conditions on Earth, following life’s universal creative principle: Life creates conditions in which more life can thrive, diversify, and evolve. For another 1400 million years planet Earth, which would have been more aptly named planet Water, was the home to primitive bacteria that lived of the chemical transformation of complex molecules present in the primordial ocean. About 3200 million years ago life invented the alchemy of photosynthesis, the ability to use sunlight to turn water and carbon dioxide into sugars that can serve as structural building blocks or food. Early life diversified and proliferated in the oceans. The spreading practice of photosynthesis began to chance the planet’s atmosphere through the oxygen that is released in the process. In an act of profound collaboration and symbiosis, some 1800 million years ago, early cells began to cooperate by one cell engulfing another without destroying it, instead diversifying roles and functions until the first complex eukaryotic cells were formed. These nucleated cells became the building blocks for more and more complex life forms, so that by 570 million years ago the shallow oceans were teaming with strange and wondrous creatures of different shapes and sizes. Life on land did not begin to take hold until about 400 million years ago, with giant forests spreading across the Earth some 380 million years ago. The first adventurous amphibians made their way out of the water and onto dry land. Over the next tens of millions of years insects and reptiles began to diversify across the giant super-continent Pangea that, around 300 million years ago, united all of the Earth’s landmasses. Suddenly, disaster struck at the end of the Permian period, some 250 million years ago, when a combination of meteor impacts and giant volcanic eruptions triggered a series of tipping points in the Earth’s climate system that resulted in run-away climate change. Methane stored in the deep oceans was released rapidly and caused catastrophic global warming which led to more that 96% of all marine and 70% of all terrestrial species going extinct over a relatively short period of time. Life took more than 10 million years to recover from this largest mass extinction in the history of our planet. What followed was the emergence of the dinosaurs and the first small (rodent-like) mammals, along with the evolution of a vast diversity of flowering plants. The continents started to drift apart and take the shape we are familiar with today. About 66 million years ago, the most famous of the Earth’s extinction events occurred as a giant asteroid struck the Gulf of Mexico creating vast clouds of smoke and ash that covered the Earth in darkness blocking our sunlight and leading to the extinction of more than 75% of all life on Earth, including all of the non-avian dinosaurs. This planetary crisis created the opportunity for the success story of mammalian evolution. Mammals began to occupy ecological niches previously inhabited by the dinosaurs. The large mountain ranges of the Alps and the Himalayas formed as continents drifted towards each other. In Africa, over millions of years, little mammals similar to today’s lemurs of Madagascar began to diversify into many species of monkeys and later apes. Until, some 4 million years ago, our earliest ancestors of the genus Australopithecus began to walk up-right across the African savannas on two feet, still with brains not much larger than a modern day chimpanzee. Lucy, the most famous of our early ancestors lived about 3.2 million years ago. The first humans evolved as little as 2.5 million years ago. From the early Homo habilis to modern Homo sapiens the size of the human brain doubled and developed its characteristic temporal lobes and pre-frontal cortex. This enabled many of the higher brain functions that today distinguish us from other apes and the rest of the animal kingdom. While we learned to use tools and fire quite early on during this period, we might not have developed the ability to speak and use complex language until as little as 50,000 years ago when a group of early Homo sapiens migrated out of Africa and successfully populated Europe, Asia, Australia and the Americas. The earliest representatives of ‘modern’ humans (Homo sapiens sapiens) are the Cro-magnon culture of Southern France dating back to only 43,000 years ago. For ten thousands of years our species survived by the guiding stories tribal elders told around the fireplace, passing on the indigenous wisdom that taught our ancestors how to survive and thrive, intimately adapted to the specific conditions of the particular ecosystems within which they lived nomadic lives. It was not until a remarkable period between 12,000 to 5,000 years ago — which we now refer to as the agricultural revolution — that more and more tribal bands of our ancestors started to develop agricultural techniques enabling them to settle in a particular place and turn their minds to building villages, towns and the first empires. With the onset of this new settled agriculturalist and pastoralist lifestyles the human impact on the planet started to intensify and the population started to grow steadily, but slowly at first. While exact data is obviously hard to come by, it is fair to assume that the global population of humans around 10000 years ago was about 5 million. At the beginning of our (Christian) calendar the global population had reached about 150 million. The first billion (1000 million) was not reached until 1804! It took only 123 years for the human population to double to 2000 million by 1927 and just 33 years until our population reached the 3 billion mark by 1960. The next two billion were added in only 27 years. By 1987 there were already 5 billion humans on Earth. It took only 12 years to add another 1000 million so that by 1999 human population had reach 6 billion and after only another 12 years 7 billion by 2011 (ref). We are failing to understand the significance of this exponential growth at our peril! According to a study published by the United Nations Department of Economic and Social Affairs, published in 2004, the human population will peak at 9.2 billion by 2075 and then start to decline slightly, reaching 8.97 billion by 2300. Obviously such projections are not an exact science and do not account for the diverse possibilities that could result in a rapid population decline due to climate catastrophes, epidemics, war, famine, and unforeseeable catastrophic events like another asteroid impact. Too few environmentalist dare to address the issue of overpopulation head on despite the fact that population numbers (and our behaviour) are the major factor influencing the rapid environmental degradation and biodiversity loss we are witnessing. This is not to say that we can’t co-create a thriving human civilization of 8 or 9 billion people within the limits of planetary boundaries. The answer to the question whether we can or not achieve this will shape the future of our species and life on Earth. Doing so is not simply an issue of technological innovation and global collaboration with regard to resource management. It will require a deeper shift in human consciousness that will lead us to celebrate the evolution of life and the story of Universe as a unifying creative process of which we all are expressions in time. We can tell an inspiring scientific story of where we come that can help us to better understand who we really are. Only then will we be able to cultivate the wisdom to help guide us to where we might want to go. How do we enable our path into the future by sharing the abundance of this living planet more fairly within the human family and the community of Life – between those alive today and future generations? We are beginning to understand that throughout evolution life has created conditions conducive to life. Our future depends on maintaining conditions on Earth favourable for human beings and the rest of the family of life. Creating conditions conducive to life is the basis of creating a regenerative culture and a prerequisite for humanity’s long-term survival. Informed by science, in particular, ecology (knowledge of the household) and inspired by philosophy (the love of wisdom), we can learn to love our communion with life and nature. The love for all living (biophilia) and love for nature as our home and the ground of our being are cornerstones of a regenerative culture.